Hand-written note with Kurt's settings for the polychorus (for Heart-Shaped Box and Radio Friendly Unit Shifter): ehx.com/blog/ehx-tone-tips-the-sound-of-nirvana From kurtsequipment.com: Effects: 10). Electro-Harmonix EchoFlanger (32)(40) and Electro-Harmonix PolyChorus (37)(seen 15). Despite the different names, the Polychorus and Echoflanger had the same internal circuitry. Kurt supposedly only had one EchoFlanger, despite what is said in (32). Kurt used the EchoFlanger on the Brazil shows (source info? Rio perhaps?) and the song "The Priest They Called Him" (found on various bootlegs, etc.). Both pedals were taken on the "In Utero" tour. The EchoFlanger sometimes "acted up" and Earnie gave Kurt his PolyChorus as a back-up. This PolyChorus was used on "In Utero" for the "Heart-Shaped Box" solo, "Radio Friendly Unit Shifter," and "Scentless Apprentice" (41). Earnie sent out another PolyChorus to Kurt, hoping to get his back, but the "new" one broke and was given to Eric Erlanderson of "Hole" who had it fixed. Earnie did eventually get his PolyChorus back, but not before Kurt marked his settings on it with nail polish and put Velcro on it. The EchoFlanger was supposed to be used on "Unplugged" but caused too much 60-cycle hum in the control room. Courtney now has Kurt's EchoFlanger (40). 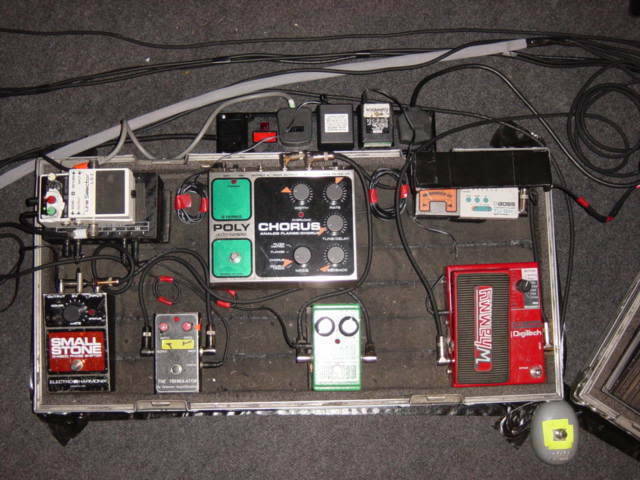 In his photo of one of Johnny's boards, a vintage Polychorus by Electro Harmonix can be seen. "I would use the Electro-Harmonix Polychorus and the Boss VB-2 vibrato pedal. Those two pedals created a tension I really liked. I like a clean tone. I don’t like to sound distorted because I feel that in the band I serve almost as a pathway between the bass and the guitar." This photo shows a vintage Electro-Harmonix Polychorus is the 2nd pedal from the left in Ryan Jarman's pedalboard (circa November 2012). 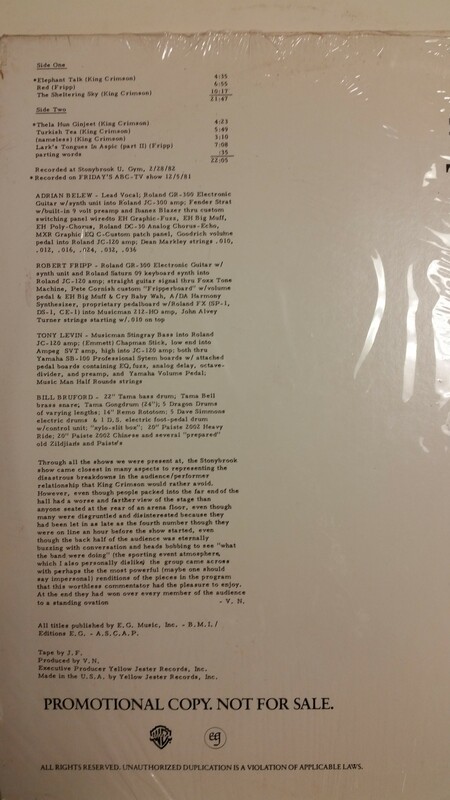 According to [this description from the back of the 1982 promotional LP "Indisciple"](http://imgur.com/AXnT9Xg), Belew's rig at the time included a Polychorus unit. According to Dunning's pedalboard photo, he also used this pedal. In this photo, posted to Adelaide's [Facebook](https://www.facebook.com/Adelaidabanda), one can clearly see an Electro-Harmonix Poly Chorus on Jurel Sónico's pedalboard. First thing you see in the video. The ultimate analog noise machine! This is a great analog multi-effect (sort of) pedal! All effects are delay based, you have Filter Matrix (which is sort of a "frozen" flanger, you can manually move it or set it on a fxed position), Flanger (a bit mild, not as pronounced as the usual suspects), Chorus (which goes from subtle to too-much-with-a-bit-of-delay) and Double Track (which is basically a short delay). It might be a bit of work to find a regular chorus sound, if that's what you're after, but it it possible. I like to use it (in Chorus mode) with both Rate and Range set at 9'o'clock, Delay and Feedback off. And the noise possibilities on this pedal are awesome. In any of the 4 modes you can go into self-oscillation by turning the feedback knob all the way up, and get weird noises by moving the other parameters around after that. My all time favorite effect pedal! I'm going to start by saying, this won't be a quick review, but it will be the most accurate as far as the differences between the different versions of this pedal. Over the years, I've seen more confusion, and misinformation on this pedal, than just about any other piece of gear I've read about before. I've owned all three versions of the EHX polychorus, and I feel like I should point out that the unit in the photo here is not the vintage model. It's the big box reissue. Before reviewing the vintage model, I feel that I should point out that the vintage and reissue models, although very similar in appearance, are two completely different circuits, use different BBD's, and sound very different from each other. The easiest ways to tell the difference between vintage and reissue are that the reissue is stereo, and features an "overload" LED. The vintage model uses two SAD1024A BBD IC's, and the reissue, MN3008 and MN3009 BBD's. Also, the Echoflanger (1977-1979), Polyflange (1979-1980), and vintage Polychorus (1981-closing of EHX) are all exactly the same circuit, marketed with different names. The vintage unit features a "blend" switch rather than the "sweep filter" on the reissue. The blend switch turns off the dry portion of the signal when in the off position, for vibrato effects, but with a very slight, but noticeable reduction in volume. The "sweep filter" on the reissue sort of tames the width of the sweep, which can get very extreme, especially at longer delay times. As I mentioned before, I have owned all three versions of this pedal, but now only have my original vintage model. Double track mode features a nice short analog slapback delay, that breaks apart in typical analog fashion at higher feedback settings. Don't expect this to replace your delay pedal, even at max delay time, it's probably not much more than 100ms or so. Chorus sounds from this pedal are incredible. Very warm and organic, just how analog should be. Lots of tweakability given that many other chorus pedals don't have controls to adjust delay time, or add in any regeneration. The the width and delay controls are interactive with each other, and can make for a sweep much wider than most traditional chorus and flanger pedals. Flange mode can do anything from subtle to full on jet plane swoosh. The filter matrix mode can be useful for sweeping your frequency around manually and finding a sweet spot to cut through a mix, or at certain settings, coaxing some banjo-esque tones of out your favorite electric guitar. The reissue, while also BBD based, just wasn't as warm and natural sounding as the original to my ears. However, its maximum delay times are a bit longer than the vintage unit, and because of that, when modulated, the ups and downs of the sweep can be VERY extreme, reaching probably a good 4 to 5 steps above and below the original note played. If you're looking for some never before heard, weird avant-garde noise rock worthy sounds, the reissue might be the way to go for you. Oh, that actually reminds me, everyone trying to replicate the Radio Friendly Unit Shifter sound from Nirvana, you're going to want the vintage model (this is where that blend switch shines). While the reissue can make lots of crazy sounds, it can't make that one without the original note droning out over the modulated sound that you hear on the album. Had this taped to a guitar body, then gigged hard on the floor for a few years. Very strong construction. With the ability to be both a chorus and a flanger, I made great use of this over the years.